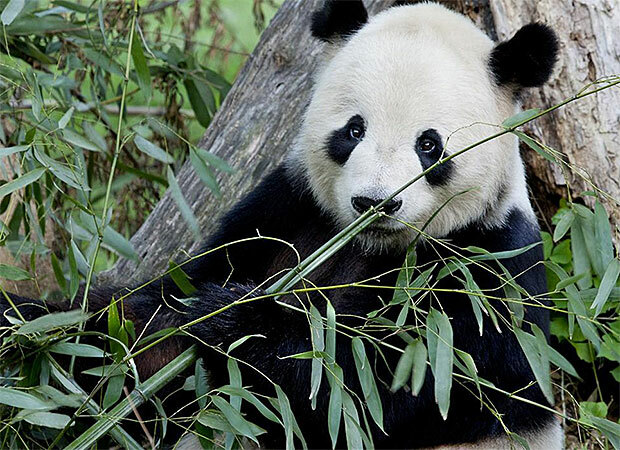 Asia Trail is home to the Smithsonian's National Zoo’s most famous residents: giant pandas Tian Tian (adult male), Mei Xiang (adult female), and a male cub named Bei Bei. Ever since the first giant pandas arrived at the Zoo in 1972, animal care staff and Smithsonian Conservation Biology Institute scientists have studied giant panda biology, behavior, breeding, reproduction, disease, ecology, and habitat in order to advance conservation efforts around the world. For those that can’t see the pandas in person at the David M. Rubenstein Family Giant Panda Habitat, online visitors can catch a glimpse on the Panda Cam, sponsored by Ford Motor Company Fund. Red pandas, Asian small-clawed otters, clouded leopards, fishing cats and sloth bears are the other residents along Asia Trial. Visitors can see sloth bears vacuum up mealworms from artificial termite mounds, watch fishing cats wade into pools, and observe Asian small-clawed otters scurry from the banks of a shallow stream to a roaring waterfall. VISITORS: The David M. Rubenstein Family Giant Panda House is partially closed. As of Sept. 1, 2017, the indoor viewing will close completely. Pandas will still be visible in their outdoor yards.